The BeoPlay E4 in-ear headphones sound great and have admirable noise-cancellation abilities, but the overall weight of the wired remote and control box makes it a less comfortable package than it should be. If noise-cancelling is a must-have feature when you’re on the market for a new set of headphones, you’ve not really been spoilt for choice if you favor in-ear buds rather than over-ear cans. In fact, scan our selection of the best in-ear options, and we’ve only really got the Bose QuietControl 30 to truly recommend, thanks to their wireless nature combined with decent sound quality and fantastic noise-cancellation. The B&O BeoPlay E4 wired earphones have the luxury of entering a relatively sparse market then, and certainly manage to hold their own. But a few annoying design decisions prevent them from being quite as good as they could be. In terms of aesthetics, the BeoPlay E4 earphones have the premium look we’ve come to expect from the B&O brand. 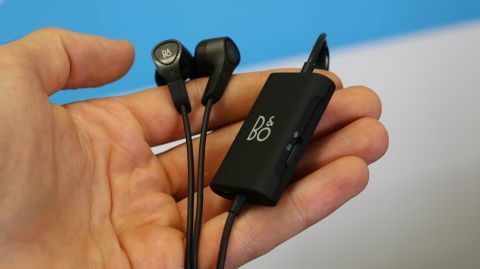 With a matte black finish, the buds themselves are made of stainless steel, but manage not to feel too bulky in the ear. A selection of five different bud sizes (one pair being foam while the others are rubber) come in the box, along with a velvety carry case and airline jack adaptor, as well as a short micro USB charging cable. It’s when we slide down the cabling that things get a bit frustrating. The 130cm cable ends in an L-shaped 3.5mm headphone jack – no problems there, and the cable manages to avoid getting itself tangled up when jammed into a bag. But it’s the noise-cancelling control box where the BeoPlay E4 hits a low. It looks innocent enough, again with a matte black finish, white B&O branding and measuring roughly 5cm x 3cm x 1cm. It’s here you’ll find the micro USB charging point and noise-cancelling controls too. However, the placement is massively annoying – little more than an inch of cabling separates it from the jack. As a result, you ever push it into the same pocket as your music player – which runs the risk of scratching your screen unless you slip it in carefully – or let it dangle outside your pocket, which adds annoying weight and tug to the ear buds. With no clip on the box, and the noise-cancelling controls designed to be within easy reach at all times, it’s an uncomfortable compromise. The noise-cancelling slider on the side, which goes from off to on and has a toggle for a ‘transparency’ mode that uses an in-line mic to let in external sound, works well enough, but the transparency mode annoyingly doesn’t pause any audio playing, instead just muting it and boosting exterior noises. As a result, I found myself just using the pause function, which sits in one of the three buttons on the in line remote a few inches down the left ear cable. As well as volume controls and pause functionality, the three buttons can be used to control track selection and answering calls, if you have an iOS device. Android users will have to just use their device’s own controls. The B&O BeoPlay E4 earphones sound great, offering a balanced sound and solid noise-cancelling capabilities. B&O quote 20 hours of noise-cancelled playback with the earphones per charge. Mileage will vary depending on volume levels, but this seems broadly accurate, and is commendable. The noise-cancelling does a pretty good job of blocking out exterior noise, producing a quiet, barely-audible hiss to counteract sounds from the real world. Working best when music is playing (as opposed to audiobooks or podcasts), the low rumblings of a tube journey where practically muted, along with the sound of cars’ wet wheels on tarmac as I took a stormy walk home one night. They’re less well suited to offices though – it seems voices can still cut through the noise-cancelling effect unless you’ve pushed the volume up very loud. Across a range of genres, the B&O BeoPlay E4 earphones sounded great. It’s a pretty balanced sound overall, leaning perhaps just a tad on the bassier end of the spectrum, with a consistent tone whether using the noise-cancelling option or otherwise. The thrashy punk sounds of ...And You Will Know Them By The Trail of Dead’s Baudelaire saw the tumble of distorted guitars and cymbal crashes cut through, without scrimping on bass levels. The more delicate ivory tinkling of Debussy’s classical Clare de Lune saw the interplay of mids and highs offer a rich soundscape, while the sharp synths and deep bass notes of Kraftwerk’s The Model we’re equally well reproduced. As for mic performance, call quality was great at either end of the call – though as with most in-line earphone mics, windy weather can affect performance. The frustrations with the noise-cancelling box aside, the BeoPlay E4 are a solid pair of earphones. They look great and sound great too, keeping up the premium expectations that you’d have from a £229 pair of earphones. The noise-cancelling is great too, up with the best we’ve heard (or should that be haven’t heard?) from in-ears. It’s the clunky positioning of the noise-cancelling control box itself that drags things down though. If it had been possible to combine the control box with the mic unit, or even simply slide it further up the cable with a clip for a shirt, it’d have been far easier to recommend the BeoPlay E4. It sounds like a minor grievance, but if you’re to use these at length, the annoyance adds up.